Bob Tiernan is an agnostic. "I'm not a hard-core atheist", he says. He was raised a Catholic and went to Jesuit College and law school. He is a practicing lawyer who specializes in issues involving separation of church and state. He is also a Democrat. This week he was in Denver to protest what he sees as the dangerous mixing of religion and politics, and the sad exlusion of non-believers in a party known for its inclusiveness. 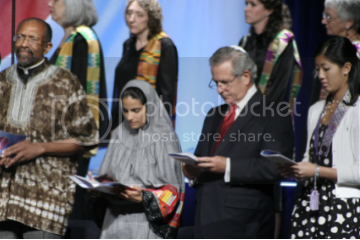 On Sunday, Tiernan attended the first event at the Democratic National Convention, an Interfaith Gathering attended by some 2,000 people at the Colorado Convention Center. Speaking were distinguished priests, rabbis, imams and religion scholars. "I sat through, I guess I'd have to call it, a service," says Tiernan. "People were responding in unison. In the middle, Leah Daughtry (a pastor and CEO of the Democratic National Convention Committee) spoke and said that despite what the media says, Democrats are people of faith." Note: This article is linking to us! Thanks Sally!